Expansion in port terminal handling capacity in Vancouver will improve Canada’s ability to service a growing Asian market and help the canola industry reach the seed, oil and meal export targets in its strategic plan. The ship loader at Viterra Pacific Elevator can fill 70,000-tonne Panamax ships at 2,800 tonnes per hour. 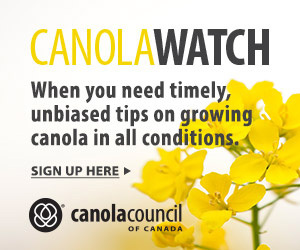 If Canada grows more canola, can we move it? 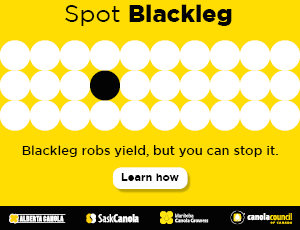 The Canadian canola industry’s strategic goal, as outlined in the Canola Council of Canada’s Keep It Coming campaign, is to increase annual canola production and sales to 26 million tonnes by 2025. This amount keeps Canadian canola on pace to maintain its market share as global demand for vegetable oil and meal increases. Achieving this goal will depend on farm production, of course, but also port capacity to move this much canola. Canada already exports over 90 per cent of the canola it produces. Of the 26-million-tonne target, the Keep It Coming 2025 goal is to export 12 million tonnes of seed and increase domestic processing to 14 million tonnes. Most of the oil and meal processed in Canada will also be exported. The U.S. is the biggest market for Canadian canola oil and meal, most of it going directly south by rail. But Asia as a whole is now the biggest port-export destination for Canadian canola products. For the 2017-18 crop year, Statistics Canada reports show that 76 per cent of seed exports, 34 per cent of canola oil exports and 28 per cent of meal exports went to Asia, with China the biggest Asian market for all three. Japan is another large traditional market for canola seed. Other Asian markets, including Pakistan and South Korea, represent a lot of the growth potential yet to be captured in the CCC strategic plan. Western Canadian bulk grain handled through Western Canadian port terminals (Vancouver, Prince Rupert and Thunder Bay) reached a record of 36.8 million tonnes in the 2016-17 crop year, as noted in Quorum Corporation’s annual report on the Canadian grain handling and transportation system. Of that, 23 million tonnes were loaded onto ships in Vancouver and just under six million tonnes went through Prince Rupert. Quorum’s preliminary data for 2017-18 show handles of 22.5 million (39 per cent oilseeds, mostly canola) for Vancouver and 5.1 million (34 per cent oilseeds, mostly canola) for Prince Rupert. Vancouver also handles most of the overseas export of canola oil and meal. In response to rising trade with Asia, exporters are investing in their West Coast terminals in preparation to unload more trains, load more ships and keep up with demand for Canadian canola seed, oil and meal. Viterra Pacific Elevator in downtown Vancouver is one of the oldest terminal elevators in Canada, but new and ongoing upgrades to rail, elevation, cleaning, sorting and ship-loading systems are increasing its throughput capacity. G3 is building the first new grain terminal in Vancouver since the 1960s. It will come on stream in 2020 with total holding capacity of 180,000 tonnes. G3 Terminal Vancouver will have a loop track design to accommodate three 134-car trains. Each train should unload in about eight hours, the company estimates, and the ship-loading system will work at up to 6,500 tonnes per hour – “far faster than the current standard”. The oldest of the three annexes at Pacific Elevator is now closed, so holding capacity is down to around 100,000 tonnes, but the old shell camouflages an internal transformation. With increased capacity to unload up to 170 cars per day and a newer ship loader that can fill 70,000-tonne Panamax ships at 2,800 tonnes per hour, Viterra has cranked up efficiency for the old facility. Quinn Kirby, operations manager for the facility, says throughput capacity is around five million tonnes per year. The 10-year upgrade plan is still ongoing, Kirby adds. Grain cleaning and dust management improvements are done. A rapid batch-scale is in operation. And a transition to complete automation is underway. To be fully automated, staff in the control centre will be able to open and close hatches, move spouts, run the cleaners and scales, engage legs and conveyors, and fill ships to exact specifications. “We’re now at 50-60 per cent automated,” Kirby says. In addition to the new G3 terminal and a complete upgrade to Viterra Pacific, many other Vancouver export facilities are upgrading or expanding. 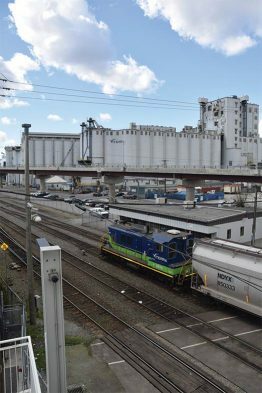 As Quorum reported, Richardson added 81,720 tonnes of capacity to its Vancouver terminal in 2016, Parrish and Heimbecker (P&H) started a project to expand its Fraser Surrey Docks terminal by 82,000 tonnes, and Alliance Grain Terminal replaced its vessel loading gallery to significantly increase throughput capacity. 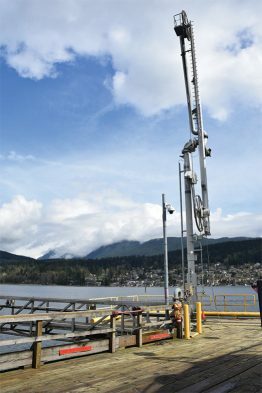 Pacific Coast Terminal in Port Moody, B.C., built a facility to handle canola oil, with train unloading , 45,000 tonnes of storage tank capacity and a ship-loading pump (shown above) that can move 1,100 tonnes of oil per hour. Expansion of Canada’s canola processing capacity across the Prairies also means increased export of oil. China imported 850,000 tonnes of oil in 2017-18, second behind the U.S., and South Korea was next with 133,000. In total, Asia takes one third of Canadian canola oil exports. Exporting canola oil through Vancouver at any great capacity is a fairly new endeavour. 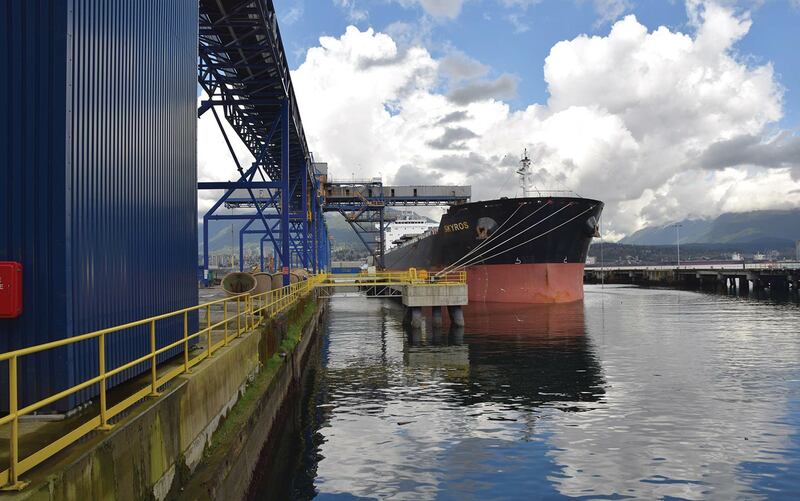 Pacific Coast Terminals (PCT), which has a dedicated canola oil facility at Port Moody, on the very eastern end of Burrard Inlet, started handling canola oil in 2015 and moved over 650,000 tonnes in 2017. PCT stores and loads canola oil coming in by tanker cars from various major processing facilities on the Prairies. PCT has three 15,000-tonne tanks dedicated to canola oil. It unloads an average of 25 tanker cars per day. Beau Storey, operations manager with PCT, says the facility could easily handle over one million tonnes of canola oil per year with its current infrastructure, and has a “theoretical capacity” of about three million if they added more storage tanks, another unloading rail-line and could get cars coming from the country on a steady pattern. “We have space to add more rail and tanks if export needs dictate,” Storey says. The marine loading facility is simple: A pipe and a pump move oil from storage tanks to ship. The pump can load at 1,100 tonnes per hour. The other major canola oil handling facility in the Port of Vancouver is West Coast Reduction, located near downtown Vancouver. Canola meal comes out of the processing plants in pellet form. The U.S. is by far the biggest market, with most going in bulk hopper cars overland, but China has been buying more and more. Exports of pelletized meal leave the West Coast in bulk or by container. P&H is the big meal mover on the West Coast, handling about 350,000 tonnes of bulk through its Fraser Surrey Docks facility, says Jarrett Beatty, export manager with P&H in Vancouver. The company shipped another 100,000 tonnes or so in containers through another West Coast facility. (Ray-Mont in Prince Rupert also handles some meal in containers.) Canola meal doesn’t flow as well as grain and can bridge in hoppers, so P&H uses a flat-bottomed warehouse at its port facility. When the new P&H terminal comes on stream in 2020, Beatty says the company could dedicate the warehouse to canola meal and potentially increase its meal capacity to one million tonnes per year. With a good network of grain handling facilities across the Prairies and with expansion in Vancouver to handle increased exports, the key connector between country and port is the rail service. Improved loading and unloading systems at the elevators and port terminals will speed up car cycle times. The other factor is “average loaded transit time” – which is the amount of time taken to move a car from a country elevator to a port terminal for unloading. Quorum data show that this transit time has been getting longer over the past two years. Average loaded transit time for cars headed to Vancouver was 4.8 days in 2015-16, 5.3 days in 2016-17 and preliminary results show 6.2 days for 2017-18. Steve Pratte, policy manager and transportation lead for the Canadian Canola Growers Association, says steps to upgrade and expand the hopper car fleet might help. The recent Transportation Modernization Act (C-49), which amended the rail companies’ maximum revenue entitlement formula, provided an incentive to upgrade the grain hopper car fleet. Both CN and CP expect to have 500 new cars in service before the end of 2018. The bottom line for canola growers is that infrastructure required to get their grain to market, meet export targets and service their customers is expanding and improving.